Both the City of San Antonio and the City of Denton will receive recognition from the Texas Music Office as "Music Friendly Communities" during the month of February 2018. The Texas Music Office will join the City of San Antonio’s Department of Arts & Culture on Monday, February 12, 2018 for a press conference announcing that San Antonio has been certified as a "Music Friendly Community." The event will take place at Culture Commons Gallery at 115 Plaza de Armas from 10am - 11am. 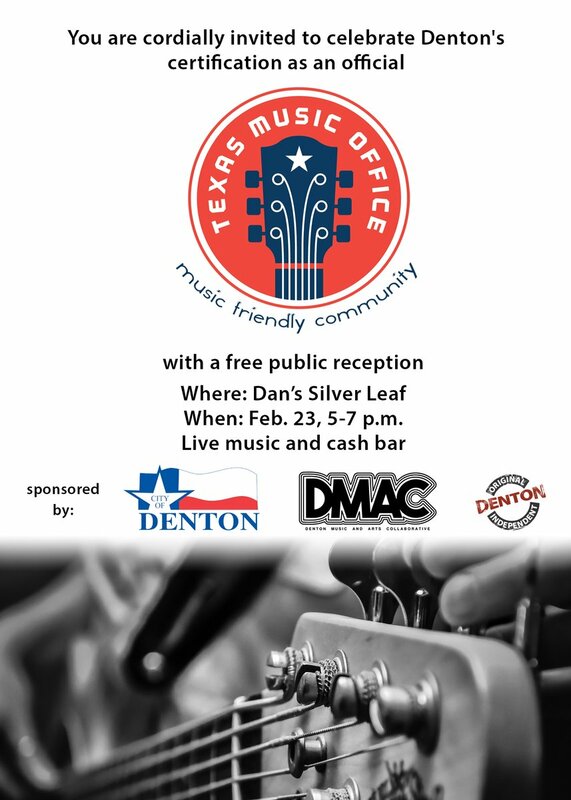 And on Friday, February 23, 2018, the Texas Music Office will join the City of Denton for a press conference and public event to announce that Denton has been certified as a "Music Friendly Community." The event will take place at Dan's Silverleaf, 103 Industrial Street, from 4pm - 5pm. "Denton’s leadership is astute regarding our music scene," said Kim Phillips, Vice President of the Denton Convention & Visitors Bureau. "Economic development strategies incorporate Denton’s creative character, placing it among our top quality of life assets. Music’s role is an economic driver, far more vital than just a cool diversion. It is a tourism attraction, an educational allure, entertainment anchor, and thriving industry pumping in dollars and drawing international attention." For more information about the Texas Music Office's "Music Friendly Communities" program, please see: https://gov.texas.gov/music/page/music-friendly-communities.